I hope you are having a good week. We had a lot of rain yesterday. This meant that Momma had to put on a raincoat and rain boots and carry me outside so I could potty VERY QUICKLY and then be carried back into the house. I do not like rain! I am hoping we will have sunny days for a while now. One of my good friends has stopped by today. Angela has a wonderful pet family, including my pal Gizmo. (He is a dachshund - Jack Russell mix dog, just like me.) Angela runs the Doxieposse on Facebook and Twitter. She has visited before, to introduce my buddy Gizmo and his family, to remember Gizmo's mother, Princess Poo, and also to mourn the loss of Gizmo's brother Teddy. Abby: Angela, thank you so much for visiting! I love the dachshund treasures you brought to show my friends. Please tell us about them. Angela: This is my little collection. I have several other stuffed dachshunds, but they are in storage at the moment. Gym members where I work started giving me doxie related items and the collection has grown through the years. First picture, I have my 3 doxie tops. A friend gave me the "my wiener does tricks" shirt. The other 2 I ordered from Etsy. The second picture includes some of my doxie collection. It's my 2 Buddy's from the movie The Secret Life of Pets. A doxie floor decoration, a doxie bookend and a doxie salt shaker my parents gave me just last weekend. The third picture are my doxie ornaments. I've collected them through the years. If I find one, I buy it. I think I may be missing one, but these are some of them. 3 more doxie stuffies. A doxie bag, doxie socks and a doxie bag. They are all lying on a doxie blanket my friend got me for Christmas. Abby: Thank you so much, Angela! I really love your collection. All your treasures are so neat, and I especially love the dachshund blanket and festive Christmas doxies! I can't resist posting a photo of your special boy Gizmo while you are here. Thank you again for your visit! Friends, if you would like to leave a message for Angela, you can do so in the comments, below. If you would like to share a pet related collection, please let me know that too (including your email). Thank you for visiting today! Have a good weekend. "My wiener does tricks"!!!! That is just cracking me up. I just love your post and I too am a dog lover... my little guy is a beagle and you have inspired me to go to my nearest pet store and get his summer wardrobe together... I'm excited and can't wait! thanks for sharing! I have a dog. I love getting new stuffs for my little fella. Your post has inspired me alot to go and get new stuffs for him. Aw the ornaments are so cute! I love this collection of stuff :) Anything with puppies is a win in my book! Abby, this is such a wonderful series! I love Angela's collection. I, too, am a dachshund item collector and I am always interested to see what other people have found. Makes me jealous, in fact ;). I am looking forward to seeing what other pet themed collections you have to feature, dachshund or otherwise! We dont have any pets but my husband would love to get a puppy sometime soon. We will see! Thank you for the sweet comments! I am glad I could inspire others to expand on their collections. I think I do have a bit of an obsession with all things doxie. 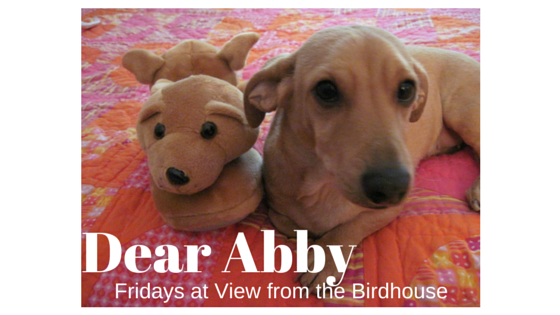 I see it, I have to have it :) Thank you Abby for featuring me and Gizzy on your blog. It is always an honor. Dear friends, thank you for visiting! I'm glad you enjoyed seeing Angela's collection. Angela, thank you and Gizmo for stopping by! It was fun visiting here. You have some great dachshund treasures!